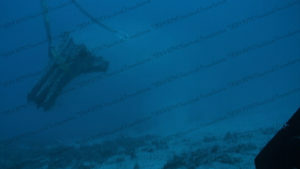 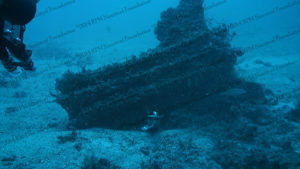 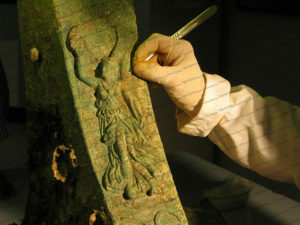 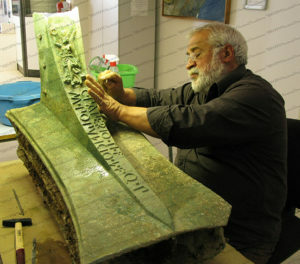 The Egadi 6 ram was recovered in 2011 in sector PW-A at an approximate depth of 70m, nearly 500 meters west of rams 4 and 5. 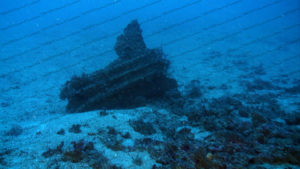 Completely intact, the ram was sitting upright at the base of a large outcrop in a location inaccessible to dragnets and static nets. 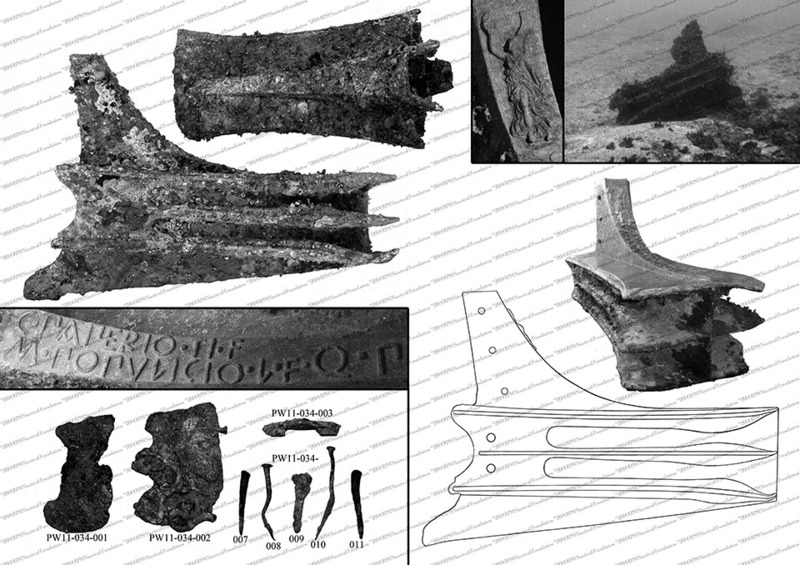 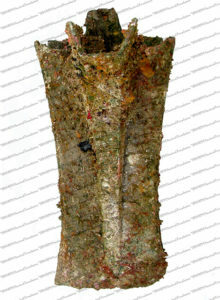 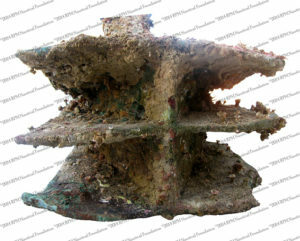 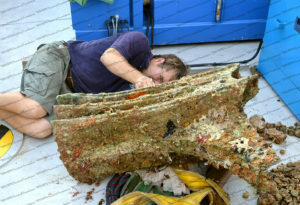 Heavy marine growth covers all exposed portions and octopus nesting revealed ram cavity artifacts such as iron nails, a tile fragment, and two bronze cheekpieces for Montefortino helmets and a bronze hinge that connected a cheekpiece to a helmet. 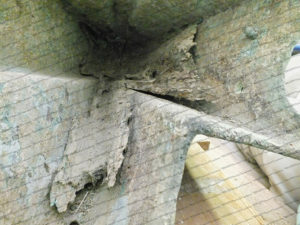 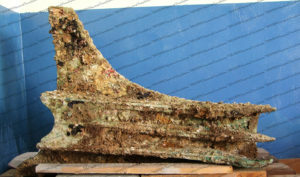 Iron nails that were clearly used for timber attachments within the hull suggest that the ram has remained near the original wreck site. 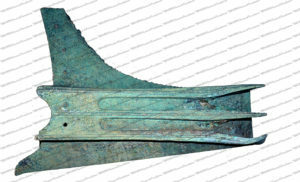 There was minimal damage to the ram other than bending of the upper and lower starboard fins at the head, almost certainly due to it having rammed into the hull of an enemy ship; the presence of wood trapped between the upper and middle fins and middle and lower fins at the starboard side of also the head attests to this. 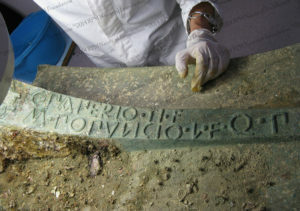 The cowl nosing bears a molded decoration and inscription. 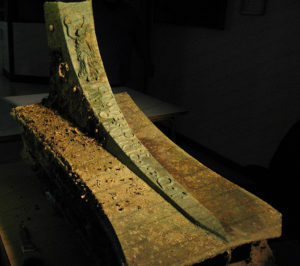 All of the ram’s surfaces were smoothed of manufacturing marks. 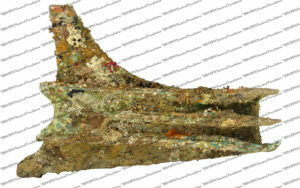 A distinctive design feature is a concave profile between its upper and lower tail fins at the inlet.